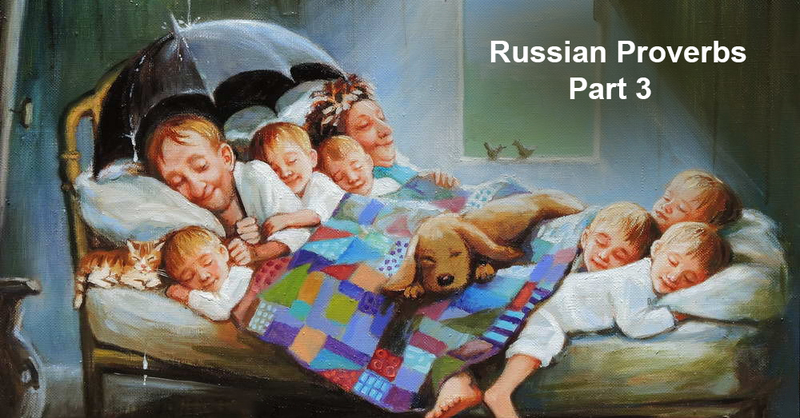 We will continue to tell you about the most popular Russian idioms. The previous parts you can find if you look at our blog. The English equivalent: “When it rains, it pours”. The literal translation: “Trouble never comes alone”. People use this saying when troubles and misfortunes follow one after another and affect a person. If there was a trouble, it will entail another one. In other words, when something bad happens, you can do no right, you fail when you do some things, you all the time think about it, and therefore, all the work will be done not in a proper way. The English equivalent: “A great ship needs deep waters”. The literal translation: “For a big ship, a big voyage”. People often use this idiom when they give advice or wish success to a talented and respected person who will be able to apply their talents in any endeavor. “В тесноте́, да не в оби́де”. The English equivalent: “The more the merrier”. The literal translation: “In a crush, yet without resentment”. The meaning of this proverb is that if in some situation there is a lack of something, for example, a place on the bus, or in a room, it is better to be there, though not in the best and comfortable conditions, but in a fairly acceptable, if there is no other choice. The main thing is the relationship between people, and if they are good, then together you can overcome all difficulties. This proverb means that if a person is afraid of difficulties or is beware of consequences of his actions, it is not worth to start doing something. If people do not believe in themselves and their abilities to achieve the goal, it will be impossible for them to succeed. The proverb means that if people have had any flaws or vices in their character or behavior since their childhood, it is impossible to change them. People use this proverb when it becomes clear that you cannot change somebody, make them better. The English equivalent: “Geese with geese, and women with women”. The literal translation: “A goose is not a pig’s friend”. The meaning of this proverb is that people different in nature, status, or any other features never come together and become friends. The meaning of this proverb is that people should be grateful for any gift that is given to them, regardless whether they like it or not. You cannot get disappointed with the gifts you have received, because it can be offensive for the one who has given this gift. It also demonstrates that a person is rude. The English equivalent: “Everyone makes mistakes”. The literal translation: “Even an old lady makes mistakes”. The word “проруха” means a mistake, a shortcoming. The proverb means that no one is ensured against mistakes, regardless their experience or age. The English equivalent: “The wind cannot be caught in a net”. The literal translation: “Look for wind in a field”. This proverb means that people are involved in useless searches for something that they will never find. These searches are as useless as looking for the wind in a field. “Как аукнется – так и откликнется”. The English equivalent: “Do unto others what you would have them do unto you”. The literal translation: “How echo is prompted, so it will bounce back”. This proverb is very popular. It means that if you treat people badly they will treat you in the same way. Good deeds are always rewarded with good things, but bad deeds always cause bad attitudes. This is the end of the third part about the most popular Russian proverbs. We hope you will find this information useful!